Moving is often an exciting adventure, but it can be a challenging and intimidating one, as well. Having moved three times in one year, I’m pretty used to packing all my belongings into two suitcases. It might be efficient, but these heavyweights still make me look like a tourist when I arrive in town, backing up the customs line, stumbling through the metro gates, and sweating profusely as I walk to my new home. It’s not really the first impression I’d like to make, but in a big, international city, you just hope for space on public transportation and pray the locals are used to it by now. Transferring your possessions is one thing, but learning a new culture (and/or a language) takes time, and often requires making a lot of mistakes. It can be difficult to learn how to properly pay at the grocery, order at a restaurant, get a sim card for your phone, or check out a library book in a new place. You can sometimes feel ‘lost at sea’ (or maybe even seasick) because of all you have to learn and navigate. For me, this is the least fun part about moving: being culturally inept. As a new immigrant – as I am again now in Rotterdam – I usually try to learn local customs as quickly as possible, so that I can blend in. As one of our professors put it, I aim for ‘integration by assimilation.’ But as an anthropologist, I already know that I will always be an outsider. Finding my way in a new country, therefore, can be a very frustrating and humbling experience. So far, however, I am glad to be in the Netherlands and back to school after summer break. Last week, we were warmly welcomed to Rotterdam by the staff and professors at Erasmus University Rotterdam. We toured the university, some tasty (or ‘lekker’ – a favorite Dutch word) restaurants, the major transportation hubs, a variety of museums, and even a nearby town. One of my favorite parts of our orientation was the boat ride. After a stimulating afternoon tour of the Maritime Museum, we walked a few blocks to board a Spido boat (or, as I thought, a ‘speedo’ boat) for a tour of the Port of Rotterdam and the River Maas. The boat took us into the harbor of Rotterdam to see the city’s skyscrapers and historic buildings, as well as the docks full of shipping containers and mechanical infrastructure. 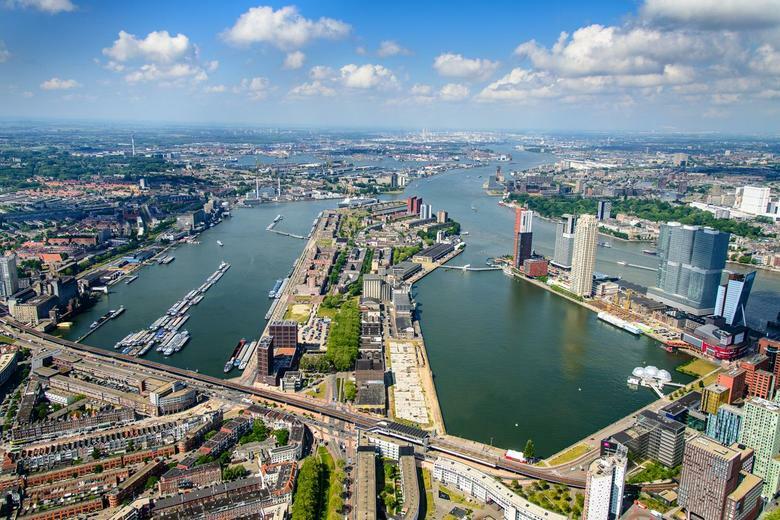 We learned that the Port of Rotterdam is owned by the city and is leased to its seafaring customers; that a historic factory was converted into an applied technical school; and that the city has a semi-permanently docked, floating hotel. One thing that helped us appreciate our tour so much was our Port Cities class in Barcelona, which was taught by professors from Rotterdam. Every semester, one school from the consortium has sent instructors to teach one course in our program. In Glasgow we learned about capitalism from a Göttingen professor, and in Barcelona we learned about port cities from three professors of Erasmus Universiteit Rotterdam. I’ve been glad to have the opportunities to learn from inspiring historians and experts in socioeconomic research. The classes encouraged me to explore unfamiliar topics from a multicultural perspective. Thanks to the GLOCAL Experience, I’m also much more firmly of the belief that no one way is right, and that it’s ok to see the world from multiple perspectives. That’s why there are so many different cultures and ways of living around the world. Some places will feel more comfortable than others, but that doesn’t mean that they are more valuable; in fact, challenging places and experiences teach us the most about life and ourselves. Nor does cultural integration have to be assimilation; you can appreciate a different country by getting involved in the local community, and by finding things that make you feel at home or more alive. If you’re really lucky, like me, you might even find a place that speaks directly to your soul. That makes the traveling, and the learning, and the moving, worth all the effort. Following our tour of Rotterdam, I felt much more oriented to the city, but I also felt like I better understood the history of the place and its cultural idiosyncrasies as well. Over the next year, I think I’ll enjoy finding more things I like about the Dutch way of life. Thanks to the boat ride, time with my classmates, and friendly professors, I now feel more at home in this new place, in Rotterdam. I may never blend in, but I’m surer of myself, like I’ve got my sea legs back.